Completely all right with you sergiox, but the images look like bad resolution because I am limited in 94k upload here, there is a solution to post heavier images???.. @Aurelalto I would recommend that you upload your images to a photo hosting website and then insert them into your message. This way you will not be limited by the maximum attachment size. Hope that helped. Thanks for the answer Blenderfan , I will fix it to the next post !! Merry Christmas to all Enjoy! Here’s my post for this lighting challenge. Rendered in multiple passes and layers with Maya and finished through compositing using Combustion. Lighting set-up was done manually,…no FG or GI employed. C&C are greatly appreciated. Thanks ! Wishing all the artist a very happy Christmas and happy holidays.May god bless us. I had a chance to spent hours and enjoyed this great museum scene. Simply adding spot lights in maya, and tried to find right angles to catch good shadows. Finally I changed some light colors only for tonight. Sorry to get back to you so late, but I’ve been in the middle of the desert without email. Anyway, thanks for the c&c and I think you are right with the raytracing issue. That and I think there is a weird UV thing going on where the left wall is getting funky, easily fixed. I wanted to pick you brain about your other comment about the right side being too brightly lit for the skylight and the T-rex shadow being too high. I actually have lights in the corridors to the left shining through, and the shadow is actually correct for that lighting scheme. I was looking at it as thought it was a dark room being lit by the skylight and then there being light coming in from the lobby on the left off screen. I agree the wall is too overexposed, but looking at the render from the framepoint of having extra strong light from an off camera lobby do you feel the light rig is not correct? Any thoughts would be great. Hello friends, Merry Christmas to all of great peace. ca we use the scene for our portafolio in regards to the lighting and texturing? Put a jpg file of the scenes . Then those guys who work in 2D softwares like photoshop and painter and … can paint over them . 2D lighting . I really like that ! Would you please do this ? gonna be a short deadline on a large scene but isn’t that how the industry works :). Just saw the challenge today and decided to see how i can work this. f3rd5 - Wow. That is truly magnificent. Your shading and lighting are terrific. It’s a beautiful scene. In terms of lighting notes, if I could mention anything, it’s that the far wall has black areas right around the windows, and I wish those areas were a bit more filled-in so the back wall had less contrast. The composition is nice, but I keep looking at it wondering if we could get-rid of some of the left side, without losing anything. Also, it feels as if we don’t get a great look at the dinosaurs from so far away. 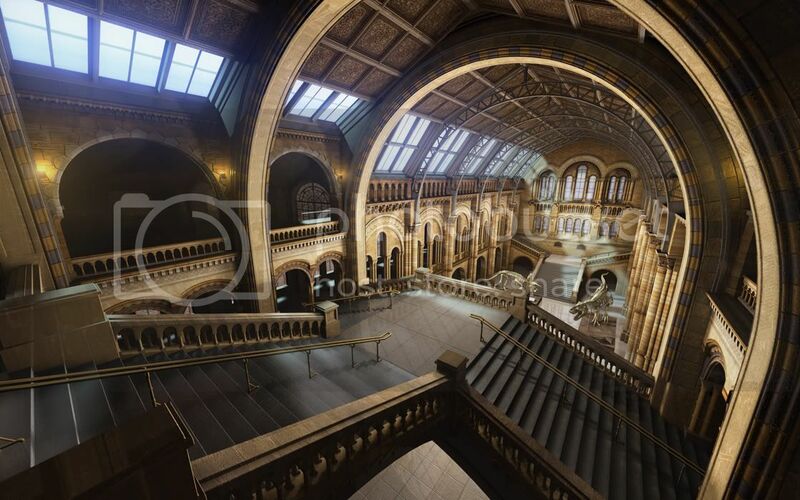 For a simulation of such a wide-angle field of view, a little barrel distortion (lens distortion) might be a good thing to try simulating, especially if you could enlarge the dinos in the center and just shrink the edges and corners with it. destijlart - Great job! I love the darkness and contrast in parts of the t-rex. The texturing on the back legs looks like horizontal stripes, maybe a different projection could be used on the long bones. The boy’s reflection could be more dark, like the reflections of the displays. I think the glass around the displays could use some highlights from the top, just to give it a little definition. BlenderFan - That’s looking really good. Dinos look nice. Yes, you could work a bit on the lighting on the set. Right now there’s blue light in what appears to be a row of semi-circles on the wall and ceiling. The light is shaped almost as if there were spotlights in the architecture, but if that were the case the light would decay with distance and be brighter at the source, dimmer far from the source. You might add some variation (or at least gradients of decay) to those lights. In addition to diffuse illumination, some highlights or reflections could also be a nice addition to the set. You don’t want to make the whole set brighter, just to selectively add some other tones and variety to the space. ahkiat - Great job! That’s looking good. I think the illumination from the little spotlights could be softer-edged. Often you need 2 lights in the same place, one with the harder edge and harder shadows, another with a broader cone angle or penumbra, a softer edge, and softer shadows, to give soft outer transition to the lights. Inside of the display cases with the skulls or fossil could have more soft indirect light, reflected within the glass and filling in the objects in the vase. AnthonyC - Great scene overall! I think the lighting on the floor especially is a bit too bright and uniform. You could darken-down the whole foreground stairs area a lot, and just have more reflections and highlights, but less diffuse illumination. Try to reduce the contrast on the far wall a bit, fill in the black areas with lighter tones, so it fades into the distance more. Nelly68 - Welcome! That’s a good start. The lighting on the two walls looks very uniform when you look outside of the sunbeams. Maybe you could give the left wall brighter fill light, becuase that’s near the sun, and darken the right? You’ll probably need more light on the dinos, too. Keep going! Aurelalto - Good start. The walls look very flatly, uniformly lit. I don’t see variation with angle, I don’t see much occlusion or shadowing, I don’t see variation with distance. Whatever source of uniform fill light you’re using, either remove it or make it read occlusion from the walls. herbertagudera - Good start. I think maybe the dino should be brighter than the alcoves in the background. Or if you’re going to make it darker at least make sure it contrasts well with the walls behind it. Kunotaku - Good start! Maybe the shadows running through the fog could be softened a bit. Make sure your fill light casts shadows or uses occlusion, right now it’s brightening the geometry on the lower right in an unnatural way. steelmonkey44 - Beautiful scene! Another area that might get a little more fine-tuning is the teeth. Aren’t the teeth the same material as the bones? The lower teeth are white against a white background, and that stops them from popping out as much as they could. vgabex - Welcome! What a great way to make an introduction, you’ve started with a first-rate scene! Congratulations! If you want some feedback: it seems that the display blocks that the dinosaurs are standing on don’t cast reflections. This is especially visible on the floor beneath the left dinosaur. The shading and texturing is good overall. I think the dinosaurs could use a little texture or variation, especially the right one. The display case with the skulls in it looks strange, I think it has too much reflection and not enough texture, and the reflections are distracting. I love the subtle fill light in the upper right corridor. Great work! Ar-Gon - Welcome! Nice scene! The set in the upper right looks as if it has some light-leaks, maybe a light isn’t casting shadows, or some geometry has backwards normals, something needs to be checked there. You could put a little more light on the head of the right dinosaur, and maybe pan over a bit so we see him more. Since we are so close to the t-rex, a little texture could help him. fuzzylizard - Good start! The walls look uniformly flat-shaded. See if you can remove the fill light that’s illuminating them, and add some light from the sky that’s brighter on top and uses shadows. Maybe a little bounce light from below could help give the walls shaping and variety as well. tuqueque - Looking good! I think the left walls (away from the sunlit side) could go a little darker, but the displays and dinosaurs in the room could get more light. Slazzo - Still looking good! The display case on the left looks strangely transparent, as if it were made of solid water. Maybe a more ordinary shader on the lower case, and a little more fill light on the skulls, could help define it better. lolofedo - Magnificent! That’s a terrific scene! I love it! If you are doing another version, one issue to think about would be a “water line” on the walls and dinosaurs, where a little bit is more wet (darker and shinier usually) right where the water has made it wet. Some of the ivy leaves should be translucent, so light behind them makes them brighter. Thanks for the comment jeremy and brookselliott:) Updates on my night scene.Added some rim for the dinosaurs head. For dayscene as suggested, added a soft blue fill and corrected the spotlight glow. My start realization created in max 2009 mr3.6.5.1, render time 2h31min, used mrSky and mrSun light sources and only FG algoritm for IndirectIllumination, materials mrArch&Design, on Q9550 processor machine, 1 render, some correction in Photoshop.